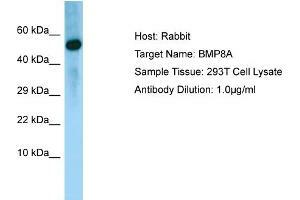 Characteristics This is a rabbit polyclonal antibody against BMP8A. It was validated on Western Blot. Background BMP8A induces cartilage and bone formation. BMP8A may be the osteoinductive factor responsible for the phenomenon of epithelial osteogenesis. BMP8A plays a role in calcium regulation and bone homeostasis .